I took this photograph in Listowel Arms Hotel on the first day of Writers’ Week 2009. Shortly after I introduced myself to Colm and told him about the blog. He said he’d be happy to be interviewed later. However, in the fire of the festival, I never got back to him – so I’m left with “the one that got away”. There can be no one aftermath. I sat upstairs in the English Market this afternoon, going back through my “Moleskine notebook (lined). I used a green highlighting pen. Put names in hand-drawn boxes, and circles around intentions. Every time I carry through something I planned, I give myself a big tick (fulfilling my bottomless love of positive feedback). Now it looks like a live animal. I’d forgotten how rich the notebook became during Writers’ Week. There are drawings and prose contributed by others – people willing to take up my book and mark the page. I was incredibly excited going to Listowel. I was incredibly tired leaving for home. The journey to and the road home are part of my LWW09 experience. Listowel Arms Hotel @ 1450 on Wed. 27 May. The family manage the hotel between them. Met George Rowley & James McGrath sitting in bar. 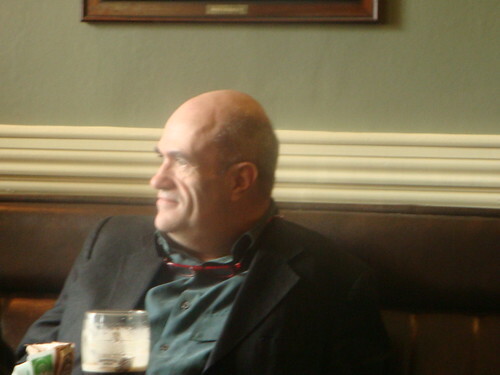 Met Colm Toibin, told him of blog – he listened, I shook his hand. For me now, the challenge is to walk the space between being an archivist (valuing the Moleskine as a document of record) and an artist (stretching, moulding & sculpting the Moleskine, so that it reaches out to the imagination of others). I’m a hoarder and long-winded. I talk&write and write&talk and sense&listen. I wonder how others are processing the experience? Despite getting to St. John’s Theatre with more than 10 minutes to spare, the room is already nearly full, with a dearth of free adjoining seats which means that I’m forced to reneigue on my promise to Rosaleen Glennon that I’d hold a seat for her. I’m safely ensconced at the back and have the laptop open and booted up. There is an announcement from one of the committee that the reading will transfer to the Listowel Arms Hotel due to the huge queue outside the door. As usual, a large swathe of the crowd, contrary to “orders”, gets up and makes for the exits as if to escape a particularly nasty stink. The man seated next to me remarks that it’s typical. Twenty minutes later we are all seated comfortably in the large conference room in the Arms Hotel. Joanna Keane starts the proceedings by delivering a well put together introduction and a short bio of Colm Tóibín which includes a cryptic (at least to me) reference to “Paradise“. As Colm approaches the podium to start, he and Joanna embrace. Colm begins by informing us that “Brooklyn” originated as a short story. He talks at length about where the story came from. He taught Jane Austen (not literally of course!) – she doesn’t use flashbacks which are a “form of laziness“. He remarks that a large number of Irish short stories deal with returned immigrants. He mentions a story called Nightfall by Daniel Corkery, one by Benedict Kiely and another by Brian MacMahon. “The holding of a dance can have an electrifying effect on a group of people“. The novel started with five sentences. Seasickness played an important part, as did a shared toilet which idea he gleaned from an experience he had with his wife on a trip up the red sea. He reads from the point where Eilish is back in her cabin after the dinner on the boat to America. There follows a very vivid description of bladder and bowel movements under duress, completed by a graphic description of vomiting that has a large number of the audience laughing, and the rest caught in that uncomfortable tornness between wanting to laugh, feeling embarrassed and memories of private humiliation that are too close for comfort. He struggles to get Miss MacAdam’s slightly northern accent. He mentions that the best early recordings of traditional Irish music were made in New York. The last section he reads is from the dance at Christmas. Colm reads beautifully: his voice conveys all the tenderness, pathos, pain and conflict of the character he is describing . There is “something in your system that guides the narrative” at crucial points in the novel writing process. He has just described the process of writing poetry I remark. What is the link between memory and imagination I ask myself.